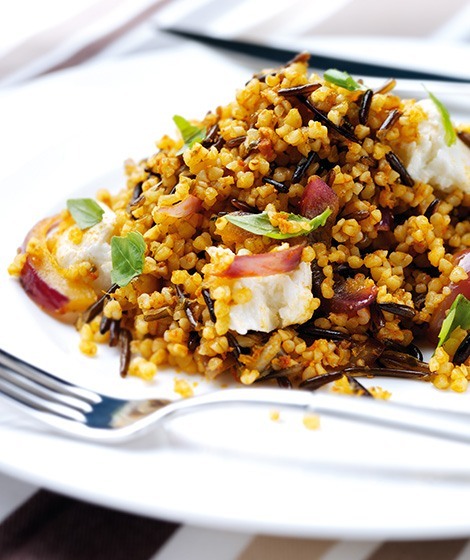 This pilaf is full of texture and flavour and tastes great hot or cold. Cook the rice in plenty of boiling water for about 20 - 25 minutes until tender. Meanwhile, put the cracked wheat and stock in a large saucepan. Cover and cook gently for 10 minutes until tender, adding a dash of water if the mixture dries out. Heat the oil in a frying pan and gently fry the onions for 8-10 minutes until very soft and browned. Drain the rice. Stir the onions, pesto, mozzarella and rice into the cracked wheat and season to taste. Stir in the basil, heat through for 1 minute and serve hot. Cracked wheat is often labelled 'bulghur' wheat in the supermarkets, usually found alongside the dried beans and pulses.